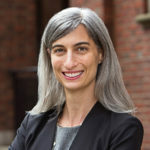 Rachel Goldbrenner is the Executive Director of the Reiss Center on Law and Security at NYU School of Law. She previously served as Senior Policy Advisor to the Permanent Representative in the Washington Office of the U.S. Mission to the UN, where she advised Ambassador Samantha Power on issues related to Asia, Europe, cybersecurity, international humanitarian law, global health and development, and cross-cutting regional and strategic national security matters. She also served at the National Security Council as director for multilateral affairs and human rights, where she coordinated interagency policy on issues relating to atrocities prevention, transitional justice, and countries in Africa, Asia and the Middle East; and as Senior Policy Advisor in the Office of Global Criminal Justice at the State Department. Before entering government, she practiced in the international litigation and arbitration group of Cleary Gottlieb Steen & Hamilton in New York. She has worked as a foreign policy and national security analyst at several U.S.-based think-tanks. She is a Term Member of the Council on Foreign Relations, and has been a Fellow of the Truman National Security Project and a Fulbright Scholar to the Netherlands. Goldbrenner has a J.D. from NYU Law School and a BA from UC Berkeley.